Skeets Fletcher and his team have enjoyed success, for decades, in the business of locating and selling unfinished and finished lots to developers and homebuilders whether they build 10, 100 or 900 homes each year. By focusing on the needs of each developer or builder he has worked with over the years in whatever sub-market in the Puget Sound region they want to be in he has been able to find thousands of lots and help them grow their business to whatever level they choose. Time has proven we know what we're doing and how to help you accomplish your objectives. Contact us to learn more or talk about how we can work together. 1. 1997 – Riverwalk in Spokane: This is the first land transaction I ever did. I realized that this 144 lot deal in Spokane opened up a whole new arena in Real Estate for me. Riverwalk was fully entitled or “permit ready” so the Buyer closed the purchase and developed the lots. 2. 1998 – Llama Landing / in Sammamish: This is the first transaction I did with Steve Burnstead Construction. It was 138 unfinished lots and the first of several land transactions I did with Steve between 1998 and 2006. The others were Woodside in McGarvey Park in Fairwood ( 60 lots ), Island Lane on Mercer Island (15 finished lots) between the South QFC and the Athletic Club. I thought the guy that called me about them was kidding but he was serious they were about to be finished. We did that deal with a 2 day feasibility and closed a month later. McGarvey Park was developed by Pt Blakely Communities and led to Issaquah Highlands (198 finished lots) where Steve bought lots in different divisions. Limelight Hotel in Sun Valley. Steve had told me to keep an eye out for something in Sun Valley, Idaho where I had lived for a couple years in the 70’s and then vacationed in the summer and winter for many years up until that time 2004. When a friend of mine in Sun Valley told me he and his family were thinking about selling an entire city block that had an unblockable view of Mt Baldy I knew this was a “one of a kind” opportunity. I knew this was something Steve would like, we talked in November of 2004 about it, he bought it, got the property entitled for a hotel with a layer of penthouses on top all looking up at the mountain Mt Baldy. It has been purchased by the group Auberge Resorts and is projected to be completed by sometime in 2018. Good relationships work for everyone. 3. 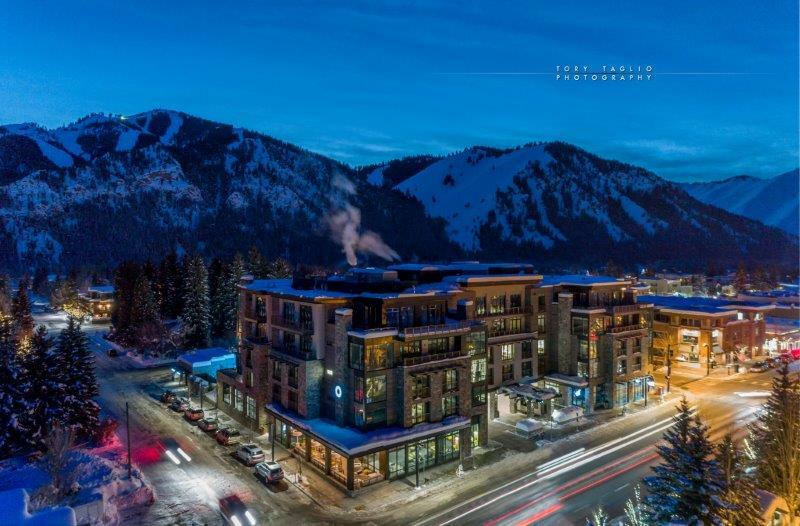 2004/2005 – Limelight Hotel in Sun Valley: I allready described this project above that Steve Burnstead Construction bought but it was such a “one of a kind” deal that it goes on my Top 10 List. Limelight Hotel in Ketchum, Idaho. Just opened in February 2017. 4. 2004 – 2007 – Quadrant w/1,300 lot deal: This was a bulk deal I did with Quadrant to help them grow and meet the objectives in their business plan. Projects included Donegal Park (144 finished lots) and Donegal Lane (58 finished lots) in Lynnwood, Trovitsky Park (169 finshed lots) in Fairwood/Renton, Kentlake Highlands (307 finished lots) in Maple Valley, the Outlook (275 finished lots) north of Mill Creek. Good relationships work well for everyone. 5. 2005 – Manor Way in Lynnwood: Manor Way (80 finished lots) was a project I got a call about from an appraiser friend of mine w/a tip about a deal going down that he thought was not going to make it. I knew Legacy Homes was almost sold out of a nearby neighborhood which had done very well. I called the owner of Legacy and confirmed he’d want this new neighborhood of finished lots. I knew the Sellers and confirmed that their current deal was not a deal yet and was floundering, I confirmed what the deal points would have to met to secure the project and did it. Good relationships work for everyone. 6. 2000 – 2016 / DR Horton: This is the longest term relationship I’ve had in the 20 years I’ve been selling land vs houses, of a 38 year career. DR Horton’s first deal with me was Miller’s Homestead (68 finished lots) in Duvall, then, over time, Woodside in McGarvey Park (200 finished lots), Issaquah Highlands (200+ finished lots), Landcastle Estates (68 finished lots) in Puyallup, Puyallup Highlands ( 34 finished lots) in Puyallup), and others that are currently pending. Good relationships work for everyone. 7. 2007 – 2008 / The Bridges in Kent: I’d like to have been able to say I sold this since The Bridges (486 lots to be finished) was such a huge chunk of business but the Great Recession caught up to us just as the developer had the first phases ready to go. After a really cool “Wine bottles” promotion where I had wine bottles relabeled to represent the 4 types of lots we were bringing to market. We targeted the top 25 homebuilders, labeled the wine bottles, had them delivered strategically over 4 days and then followed up for meetings to determine level of interest. It was a blast! We even had a homebuilder gettting into his car with a $400,000 Earnest Money check ready to waive feasibility on Phase 1 and his gut told him to get out of the car and don’t do it. What also was really memorable for me was the promotion we did to launch this project (see pictures). 8. Talbot Place in Kirkland: (11 Unfinished lots permit ready) This was the one that proved that the recession was over. I sold an 11 unit townhouse project to the Developer/Builder and Carrie Lord (my fiance’) and I sold the homes. Good old Kirkland! 9. 2008 – 2010 / Honeybrooke West: I got a listing on 50 lots in the Renton Highlands called Honeybrooke West (50 finished lots) that were essentially finished. We went to market with it, got 6 offers (in the summer of 2008 you may remember the market was clearly depressed) sold it to a little start-up company from Puyallup called SDC Homes (that later sold out to Richmond American) that could build smaller, less amenitized homes (the furnace was an upgrade) and for half of the price that the Renton Highlands sub-market was still trying to get for homes. We loaded them onto the NWMLS on a wednesday, went on site thursday – sunday and sold 22 of them. During the next 17 days or a total of 21 days we sold 46 of 50, closed the acquisition of the lots with the King County Superior Courts approval and started the first 25 within app. 45 days with funding from a local bank before the Feds shut them down. We switched to private capital, bought a nearby plat from Camwest Homes Alderwood Crossing (60 finished lots) and a 7 lot neighborhood from the same lender that financed Honeybrooks’s development, acquired a 46 lot plat called Tahoma Vista II (46 finished lots) in Kent and proceeded to sell them all out in about 16 months. It was so amazing to have that level of success during the recession but it proved to everyone what price could do. This ended up accounting for app. $64m in total land and house sales during the most depressing and long lasting downturn anybody had ever experienced. 50 finished lots from the King County Superior Court to a start-up homebuilder, pre-sales of homes with an average sales price of $300k for 2,000 square foot houses in a sub-market that averaged $600k for 3,000 square foot houses and a bunch of really motivated buyers who recognized a great value no matter what the economy was doing and you have a really good success story for a team of professionals who really dug in and worked together. 10. 2013 – 2016 / Finished and Unfinished lots in Pierce County: We sold this 600 unit multi-family parcel to a California developer, he re-entitled it into 206 lot single family lots and we sold it to a local developer who is finishing the lots. We then sold the finished lots to a local “Top 10” builder. By the time the finished lots were sold this project accounted for app. $23m. What I call the Top 10 or most interesting projects I’ve worked on accounts for the sale of app. 3,900 finished or unfinished lots of app. 6,500 lots I’ve sold so far. Comments: Whether its a 1-2 lot deal for smaller short plats to $20 – 30,000,000 deals to large builders I’ve enjoyed each and every one of them. It didn’t have to be a large deal like Rainier Vista ( 144 finished lots for $175,000 or $25.2m, a series of deals in Woodside in McGarvey Park (260 finished lots for app. $20.2m, Seattle Hill (275 finished lots at $39m to be fun and profitable but the big ones are always complicated and require professional developers and builders to work together.